Did Google and Red Robin Just Make a Banner Ad That’s Actually Cool? Banner ads are pretty much the bane of every digital consumer's existence. So, it's no small measure that Red Robin just launched—through a partnership with Google—an interactive display campaign that could actually turn sci-fi fans into patrons of the fast-casual burger chain. The brand worked with Google and its digital agency, Vitro, to create immersive video promos for Red Robin's Terminator Genisys campaign, which also includes TV spots and signage in the company's restaurants. 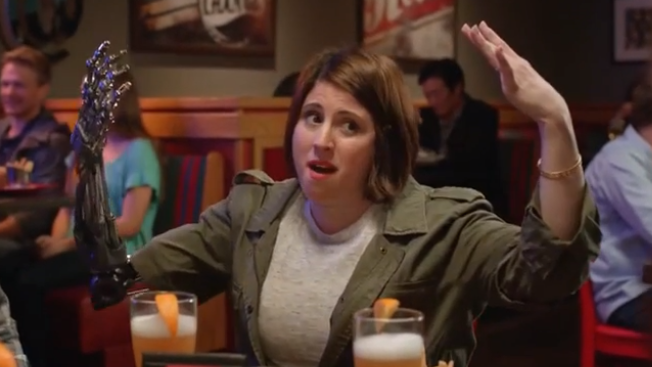 The ads let viewers see Red Robin pitchwoman "Melanie" as a Terminator character would. They can use their smartphones to add another digital layer to the experience or watch on their desktops for a simpler view. The four-week digital initiative marks Red Robin's biggest interactive budget of the year. The immersive banners will appear on more than 1,000 websites in the Google advertising network as well as on targeted destinations such as IGN, IMDB and Fandango. It's the first time Red Robin has partnered with Google. But if sci-fi fans like what they see (and buy burgers), it probably won't be the last time the two work together.